Hello friends, hope everyone is doing fine. Thanks a lot for all your concern of my disappearing :-)...nothing much I'm just plain busy and held up with work, unable to do any blogging. Also doing the so late roundup of Festive Food: Diwali Event. 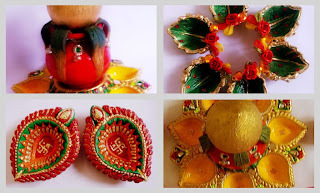 There are so many entries that I lost the count ;)....so not holding you guys any further (since I know most of you are waiting for the roundup) let's check out the 1st part of Diwali roundup of Diyas/Lamps, Rangoli and other decorations. I have try to included all the entries, if I have missed out any kindly do let me know. Let's start the roundup with Ganesh. 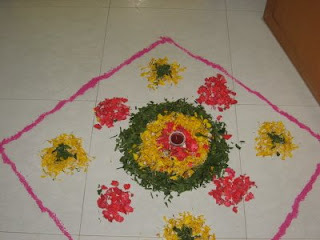 This is done in our house on Dhanteras day. And pray to God to get the blessings. Arundhuti brought these diyas from Diwali market in Kolkata...such lovely and cute diyas...wonderful choice what say? 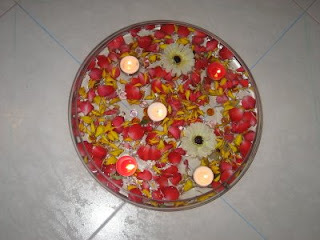 Checkout the simple and elegant Flower Rangoli made by Purva for Diwali. 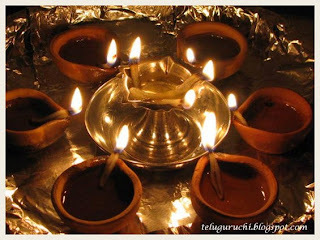 Aren't these are cute diyas & Mehndi ? 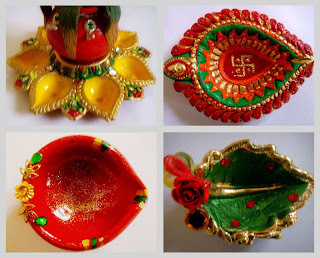 Check our bong gal Sudeshna post to know how she has painted lovely diyas, and the rangoli. 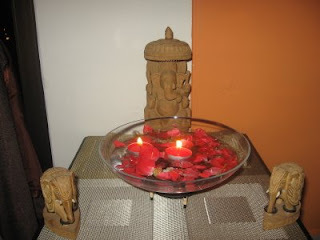 Here is the beautiful display of Diyas/Lamp from Uma, check her blog for the Sweet Pongal recipe. 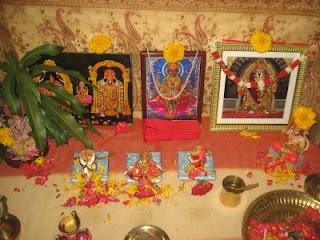 Here is the way Sukanya has celebrated Diwali this year..these wonderful rongali, decoration. Visit her post for the nice bhajan link and other details. Here is wonderful display of serial lights and Lanterns. 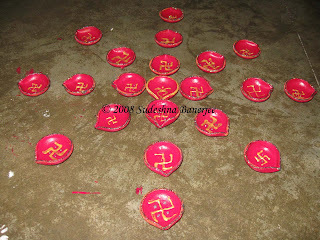 And comes my entry for the event, diyas painted by ourself. 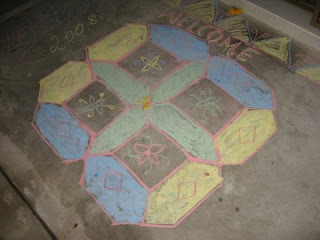 Colour and flower rangoli done by my sister. Thank You all for the wonderful entires...stay tune for the next part of roundup. 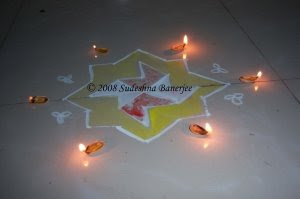 beautiful diya and rangolis..waiting to see more..
Hi Priti,WOW!! what a great round up & so many ideas. enjoyed all the snaps..good going.. 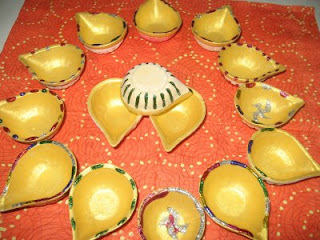 Wonderful collection of Diya's. 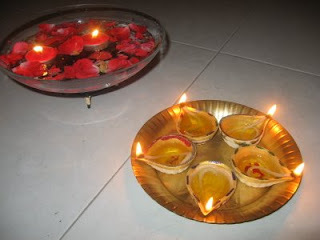 I personally liked the conch shell type Diya's. Wonderful round up, Was really getting worried about your disappearing act.Glad to c u back.Waiting for the next part. Great job as usual. 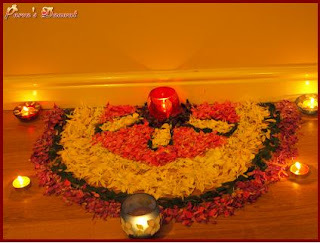 beautiful diyas and rangoli! A festive atmosphere is here! Thanks for the wonderful round up Priti! Please check: my name is misspelled as "Ump". How could i miss this event??????? Priti You have something in my blog. Such pretty and festive looking stuff! Have awards for you ..please pick them up! Uma, I'm so sorry about that, have corrected the name. Wow awesome roundup. Nice to see u back after so many days. Missed you. nice strting priti...waiting 4 the second round up..update soon..
everythin looks so festive...missed the event due to reak,,,whts the next event,..? Though u r busy,i appreciate you posting!! Great one yaar!